Oscar Sunday is here again, and some of us may have seen a list posted on Facebook called "Ten Films That Have Stayed With Me", but I must admit without some screen caps or the movies' trailers they lose their impact just a little bit. Not all of the movies on my own personal list can be considered "retro" but they all have one thing in common: all weighed heavily on my mind and replayed themselves in my head long after the credits stopped rolling--a sign of truly great filmmaking. They've also given me the occasional craving to watch them again and try to recapture that magic of seeing them for the first time. By all accounts, this should have been a flop. You're taking the four biggest musicians on the planet with virtually zero acting experience and plunking them into a movie. Yeah, right. We saw how well From Justin to Kelly did at the box office. (Not that anyone from American Idol compares to the Beatles but you know what I mean.) But fortunately the Beatles had screenwriter Alun Owen--who wisely spent time with the Fabs to get to know them and their accents--and director Richard Lester. The result is an iconic, groundbreaking, rock and roll-themed movie that actually was funny, entertaining, and considered a precursor to the music video. And for those of us swept up in the madness of Beatlemania, it provided a pretty good idea--if a fictional one--of what a typical day in the life of the Beatles was like. To be honest, it isn't so much the movie itself--with its doomed romance, bitter cold settings and bleak conclusion--that makes me include it on this list. It's here because it was the first movie that made me appreciate how films are made. I had watched a documentary on PBS about the making of Doctor Zhivago and was blown away by the fact that many of the winter scenes were filmed in Spain in the middle of summer. The "Ice House" that Laura and Zhivago take refuge in was coated with beeswax. Omar Sharif had the skin around his eyes taped back to make him look more Slavic, which he said was painful after a while. And yet the critics were unkind to director David Lean when the movie was released in 1965, calling the set designs "paltry." Are you kidding me? Further insult came when the Best Picture Oscar of 1966 was awarded to The Sound of Music--a movie which I do love dearly, but can't touch the epic effort that it took to get Doctor Zhivago made. This is my favorite childhood movie ever, and it's shameful that Tim Burton would attempt to trump it years later by giving it a CGI-laden, Johnny Depp makeover. No thanks! There is only one Willy Wonka and he's portrayed brilliantly by Gene Wilder, a man who seems to be hiding something sinister beneath the sweetness of his workplace. This is a movie that every child should watch, as there's a lesson to be learned; one by one, the spoiled kids get their just desserts in a fantastically psychedelic setting. Plus the songs. Plus the Oompa Loompas. Plus the creepy boat ride. It all gives me a craving--not for candy--but to watch this magnificent film again. Today's kids will never know what it like seeing the first Star Wars (technically Episode IV: A New Hope) in the theaters in the mid-70s. I was five years old and I can still remember driving home after seeing it with both of my parents, who enjoyed it just as much as I did. I still have several Kenner toys from the '70s in storage (that I'm actually thinking of unloading on eBay...if anyone is in the buyer's market for an original remote control R2D2 that still works, email me.) I know everyone is getting psyched about The Force Awakens to be released this year, but for me personally any new film in the Star Wars saga won't be as magical as the original. Then again, maybe George Lucas will prove me wrong. A mad Jack Nicholson pursuing his family with an ax? No problem. An extraterrestrial creature that bursts out of the people's chests, however? I'll make sure my bedroom lamp has a brand new bulb in it that won't risk burning out while I sleep. No use crying for your mama, you poor bastards. In space, no one can hear you scream. It's a shame that M. Night Shyamalan hit a home run with his first film, The Sixth Sense, only to bomb with every project ever since. Nonetheless, the movie is one of my all-time favorites, with a surprise ending that no one saw coming and a heart aching performance by Haley Joel Osment, when he was young and cute. This movie also contains a scene that makes me cry, without fail, and that's the part where Cole confesses his secret to his mother and discusses his dead grandmother with her. I fell for Kevin Spacey after seeing this movie--but more importantly, I kind of feel like I can relate to his character in it now that I'm middle-aged, even though I'm not married and don't have children. It's hard to believe that American Beauty was released 16 years ago, but it really is kind of a timeless film. Spacey himself had said he could see his mentor, Jack Lemmon, playing the part of Lester Burnham in another era. Something interesting to note--I have yet to meet a married guy who says he dislikes this movie. I'm not sure what that says about the state of American marriages today. Quentin Tarantino rewrites WWII history with a lot of humor (and his trademark violence) and introduces the world to Christoph Waltz. That's...a...bingo! It's funny how the trailer focuses on Brad Pitt, the initial draw for the movie...when Waltz's Hans Landa steals the film within the first ten minutes. OK, I'll admit it--I'm madly in love with a fictional character thanks to this film and that would be the amazing and painless Dr. King Schultz. Maybe it helped that he was portrayed by Christoph Waltz but still...this man is the epitome of a kind gentleman in every way. Well, when he wasn't popping a cap into a bounty or a slave owner but even then, he does it with grace and style thanks to the Derringer he keeps up his sleeve. A film or series about the backstory of this slightly mysterious character that teams up with Django is sorely needed. Now what number can I call to make an appointment with this bounty hunting dentist? What are some of your favorite films that have stuck with you through the years? This is a great list, Pam. I've seen them all! The Sixth Sense is one of my favorites and of course - A Hard Day's Night. The movie really made them seem like everyday guys (which they never were from the time they became famous). Thanks, Cherdo! I really want to see The Sixth Sense again after compiling this list and watching the trailer. are on my list, too! Pretty good list, barring Tarantino. Can't stomach the man's violence. 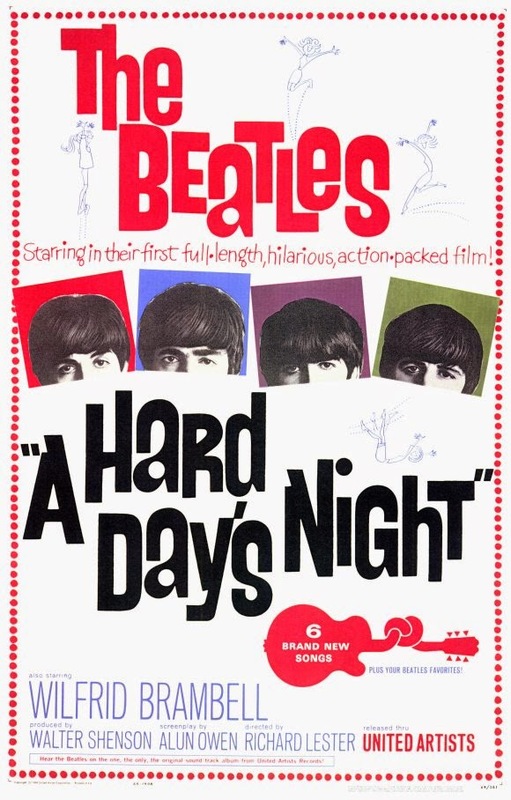 I went and saw A Hard Day's Night with a mate and my brother at the afternoon matinee, and my Mum and Dad went that evening. That shows the power of the Beatles. That we all loved the film and its stars show the skill of Lester. American Beauty? I'm kinda married, and I find it a brilliant but uncomfortable film. I've only watched it once. Not busting to see it again though it is a great movie.